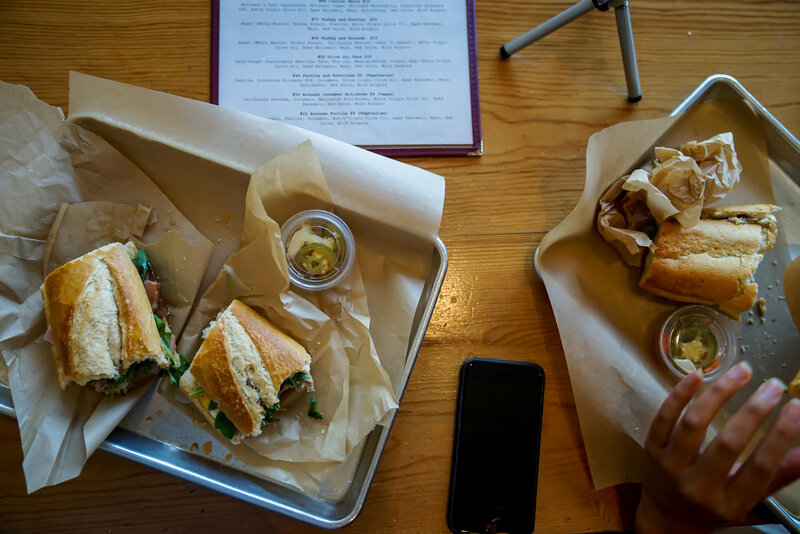 When I asked my Facebook friends about their favorite sandwich, the responses piled on like Italian cold cuts in a muffaletta. Considering the universal enthusiasm for sammies, I'm taking everyone out to try the sandwich that is dear to their heart. Sandwich Project is exploration of what lies between two pieces of bread. Jenn Wong’s Facebook Response: "#55 Olive Oil Tuna at Sopressata Silverlake"
Shortly after my study abroad program in 2004, a friend and I traveled to Lake Como to gawk at George Clooney’s villa. We slept in hostel bunk beds with carefree grins on our faces and very few euros in our heavy backpacks. Back then, words like “adulting” didn’t exist, which is great because it’s a stupid word and I was doing anything but adulting. I was 20somethinging. During the previous four months, I spent all my money on tubs of gelato and subsequently larger pants to accommodate the gelato weight gain, so by the time I arrived in Lake Como I could only afford bus tickets and canned tuna, my daily lunch ration. Every afternoon on the water’s edge, we peeled back tins of olive oil-packed tuna (Tonno all'Olio di oliva) and flaked off small bites with our plastic forks. Nibbling away at the silky, rich, and absolutely sumptuous Italian canned tuna, we stared at Clooney’s estate from afar and felt luxurious. Fast forward to the great Sandwich Project of today, Jenn Wong's choice of “olive oil tuna” stirred my nostalgic senses...like any great sandwich should. Jenn, or @wayofthewong as she’s known on the socials, is a cheery cocktail connoisseur with the bubbly presence of an Aperol Spritz. 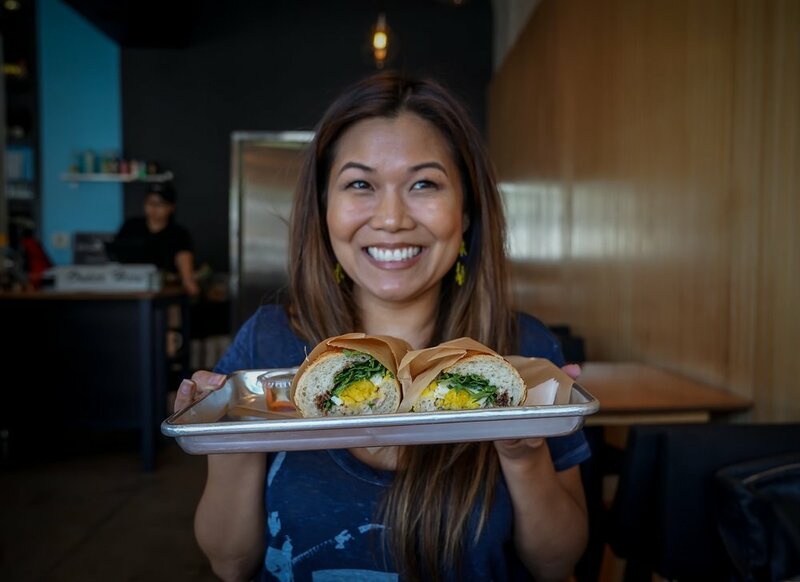 Her refreshing effervescence is the buzz you need after circling Sunset like a goon looking for parking, and her enthusiasm for inspired boozery and sandwich artistry is infectious. When we sat down at Sopressata, she was giddy with sandwich fodder and began our conversation by pacing through her other favorites– the Media Noche at Portos, the Cuban at Monte 52 in the Tropicana Market, the Godmother at Bay Cities, and the Cold Cut at Eagle Rock Bakery– before finally chomping on the #55. 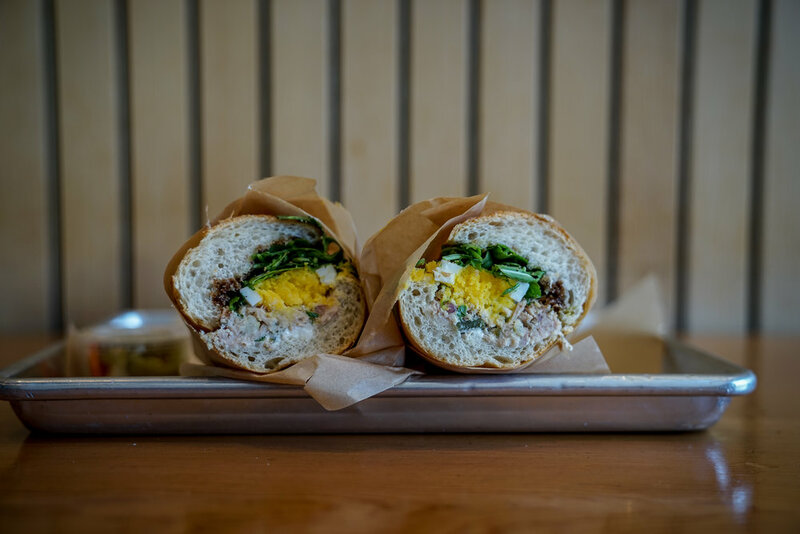 The #55 is a glorious concoction of Italian flavors piled between a toasty baguette ($10). Pole-caught sustainable tuna glistens with olive oil; mix-ins are layered among a medium-boiled organic egg, red onion and wild arugula; and aged balsamic and mayo lightly soak the bread. Jenn discovered the #55 on a whim when Sopressata opened two years ago. At the time, #88 was all the rage: a stack of Italian cold cuts with melted provolone and artichokes. On this day, we ordered that too and it’s a thing of beauty. But that day, the day of her fortuitous first visit, she simply wasn’t in the mood for a tower of meat. She wanted lighter fare. She wanted tuna with olive oil. And I don’t blame her. “The olive oil not only makes it lighter, it adds so much flavor,” she continues to dissect the #55. “There’s mayo, but it’s not the sloppy tuna salad that we’re used to. And that egg gives it a texture that’s different and I love the balsamic.” With an overflowing personal liquor stock, Jenn can attest to making a tasty tipple at home. But sandwiches? Those should be left to the experts. As we savor our last bites, Jenn admits that she thinks about this sandwich when she’s not eating it. And yet again, I don't blame her. 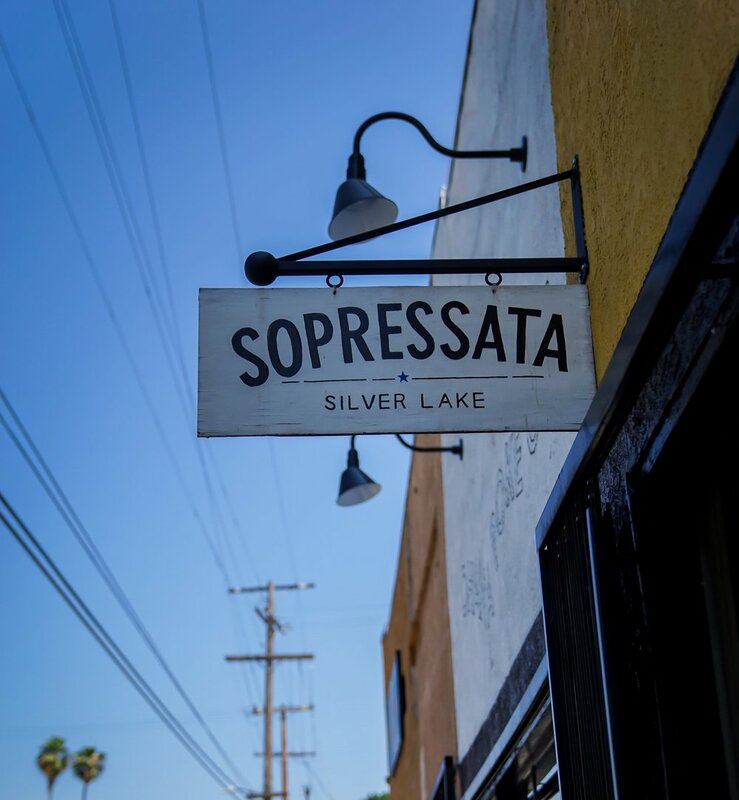 With #55 at Sopressata, I'm able to drift off to the silver waters of Lake Como when adulting didn't exist, and I begin counting the money I'm spending on sandwiches...and soon on larger pants.